S12D is open for business. 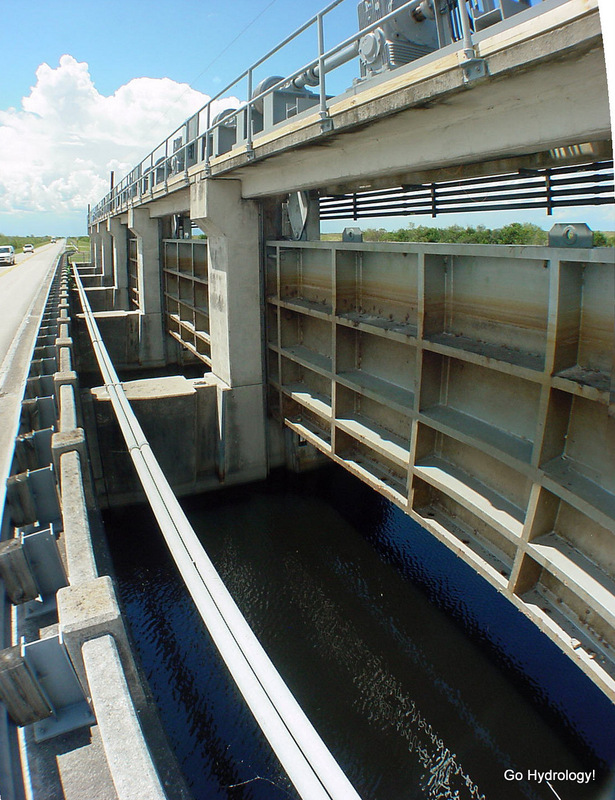 It lets water into downstream Everglades Nat'l Park. are pulled up as high as they'll go? Word on the street is that its getting rehabilitated and automated, too. At least that's what I read on the road-side sign. Roughly 15 years ago, I was walking across either S-10A or C. At the time, it had these unusual tiedown eyes and a huge set of rollers on the top of the structure, along with yellow paint outlining several areas. There was also a sign that said something along the lines of "make sure truck is secure before operating gate". After scratching my head for a few minutes, I concluded that the gate was operated by putting a pickup truck's drive wheels on a set of rollers, securing the truck against movement, and then using the truck to open and close the gate. That's funny ... and good sleuthing, too. How times have changed. Part of this retrofit is safety related. The old method as you describe ti sounds sort of precarious. It's always amazing what you can see by stopping to take a look.